All transactions are safe and secure with a reliable history in online purchasing behind each of our associates. Buy the Yoda Only Once You Live t-shirt to own Star Wars clothing and merchandise. Harness the power of the force and live for every moment in this Yoda Star Wars tee that displays a Yoda-style play on the popular phrase YOLO (You Only Live Once). Remember that when the Dark Side encourages you to lift one too many beers to your mouth, or to use your lightsaber to chop down your neighbor's tree. Just be careful you don't end up on a one way journey to the Dark Side. Remember, live like Anakin, don't overindulge like Vader. 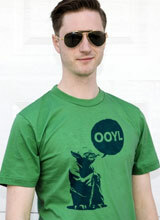 These YOLO Yoda Star Wars t-shirts display the abbreviated phrase, "Only Once You Live". In addition to the Yoda Only Once You Live tee above, browse the Star Wars Clothing Gallery for more apparel like men's and women's clothes, kids shirts or hoodies.